Keeping customers returning to your business can often be a challenge in this digital world. It's more common than not that customers will have done research online before making purchases. Sometimes what they find will be enough to cause them to switch to one of your competitors. 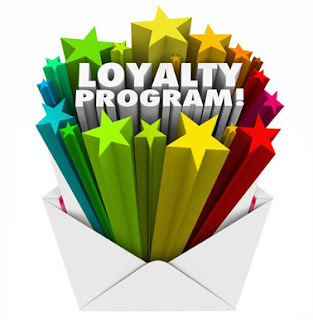 Loyalty programs, sometimes known as reward programs or incentive programs, can help you retain your customers and solidify the relationship they have with your company. Here are five reasons to consider instituting a customer loyalty program. If you currently have one, you can review this list to make sure it is accomplishing all five of the following outcomes. Customers who participate in loyalty programs are more motivated to become repeat shoppers because you're giving them something in return for patronizing your business. Living in a suburb, I have more than a few options of grocery stores. Meijer keeps me coming back by giving me cash back after every $100 in purchases, in addition to the extra discounts I get for being a member. I e-clip my coupons and scan my phone at check-out to receive my discounts. Many stores are using this same strategy. I keep coming back for the discounts and the rebates. The store even sends me emails letting me know what is coming on sale in the week and notifying me that I am close to or have earned the next reward. Today it's very easy to do cost comparisons online. If price is a deciding factor for your customer, you can quickly and easily lose out to the next guy. A loyalty program builds a relationship with your customer. Rewarding people for making a purchase from your company builds on that relationship and increases their loyalty to you. Extending special discounts to customers who have signed up to be part of your program builds a feeling of exclusivity. They're getting something the guy checking out in front of them who is not participating in the program is not. And all of their purchases are adding up to some kind of reward in the future. We've all seen the statistics about how much harder it is to find new customers than retain current ones. Or we've heard the stat about how 20% of the people account for 80% of your business. A rewards program keeps you joined to your customer. I picture it as one of those sticky hands toys. Your customer may stretch far away from you at times, but the fact remains that you are still connected. In the grocery loyalty programs I am a member of, I receive emails from the stores at least once a week. They are clearly making sure to increase their "stickiness" but letting me know that they have not forgotten about me. Rewards programs gives you an opportunity to learn more about your customers. You can collect data on not only demographics, but spending habits as well. What are your customers buying? How often? At which of your locations? At your brick and mortar store or online? Because loyalty programs let you essentially follow your customer around over an extended period of time, you can learn a lot about what resonates with your customers and where you need to make changes. Mariano's is smart. Every Friday, I receive an email inviting me to download the week's Free Friday download. Typically, these are two items with a retail cost of only a few dollars. I'm walking into their store because I want to pick up my free 8 oz. Greek yogurt or a jar of their pasta sauce. I find this brilliant for two reasons. First, rarely do I pick up my freebies only and leave. It's usually a matter of - while I'm here, let me pick up this or that as well. At the same time, the store is getting me to try some of their products. Now when pasta sauce shows up on the grocery list, guess which one we're buying? I don't know that I would have ever tried their sauce because we were always content with the one we were previously using. These are just a few ways that customer loyalty rewards programs are effective. If you have others, feel free to share in the comments section. The bottom line is this is one more tool to build and develop a relationship with your customers. If you view as such rather than simply increasing your revenue, it's a win-win for both you and your customers over the long term. Find out why rewards programs are also effective when used with employees and channel partners, too.